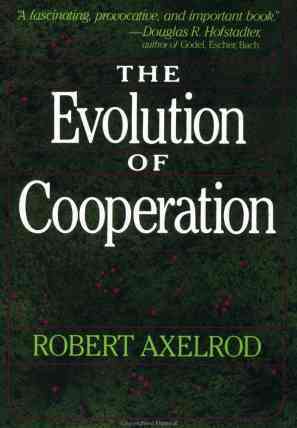 The Evolution of Cooperation was the title of a 1981 article co-authored by the political science professor Robert Axelrod and the late evolutionary biologist William D. Hamilton. Robert Axelrod expanded it into a book in 1984. It is interesting to note this book which was written more than 20 years ago is still fresh in ideas. Some philosophers said human are born benign, but some said otherwise. The most famous answer was given over three hundred years ago by Thomas Hobbes. He was pessimistic and argued that before government existed, the state of nature was dominated by the problem of selfish individuals who competed on ruthless terms and life was solitary, poor, nasty, brutish and short. He thought cooperation could not develop without a central authority. You may have heard, or played, the Prisoners' Dilemma. The setting was that two criminals together committed a serious crime were caught. The detective kept them in separate cells and asked each of them to confess the crime. Circumstantial evidence was weak and so if both of them cooperated and kept silence, they would only be convicted of a minor offense. The detective told each of them that if he confessed and turned into a prosecution witness against the other, he would be acquitted while the other would get the maximum sentence. If both of them confessed, they could beg leniency for a lighter sentence. The game theorists proved that the best strategy for the game was to confess and to defect against the other. This may partly prove that Thomas Hobbes was right. The crux of the game was that the prisoners did not know the intention of the other party. They could only guess the scenarios and calculate the probability of returns. Axelrod developed a variation of the game, involving repeated game interactions between two players with the results of each interactions known to them. He gave scores to each game played: 3 points each for mutual cooperation, 1 points each for punishment of mutual defection, 5 points for defection leading to conviction of the other, and 0 point for keeping silence while being defected against. When previous performance of the other side was known, the player could take it into account and develop a strategy to take advantage of cooperation and also timely defection to gain points. There is afterall merit in cooperation sometimes. A computer programming tournament of the iterated game was organized. Programmers engaged various strategies, ranging from algorithmic complexity, initial hostility, occasional defection, being nice or forgiving to induce cooperation, etc. The winner of the game was the program Tic-for-tac. Its strategy was to be nice and cooperative on the first move, then consistently repaying cooperation or defection according to the last move of the opponent. Analysis showed that the success of Tic-for-tac was based on four factors: being nice and never defect first, being provocable as it would retaliate by defecting whenever defected upon, being forgiving as it only retaliated once; being clear in intention as its strategy was quickly known by its opponents. Axelrod concluded that these basic characteristics were conducive to developing cooperation. Being nice and forgiving were essential attributes while making them known was also important. Being provocable was a good defense from being bullied of being nice and could raise the chance of survival. A further conclusion by Axelrod was that Tic-for-tac was robust even in a hostile environment. In such an environment where there was no cooperation, participants would gain a few points through mutual defection and a single Tic-for-tac would die out. However, if there were a small number of Tic-for-tac in such environment, interactions of cooperation between them would bring more points. If they were a close group, then such in-group interactions, however small in number, would be better off than the always-defect majority. As a result, this Tic-for-tac group would grow in the population and cooperation would eventually evolve to be the dominating strategy. This phenomenon has been observed in the development of many civilizations. The book also found that cooperation did not necessarily occur between friendly parties. It described the case of the trench warfare in World War I. Known as Live and Let Live, troops on both sides of the trench warfare spontaneously developed a strategy of cooperation whereby they shelled the other side according to a fixed schedule only known to the soldiers and allowing either side to minimize casualties. The generals were satisfied that the war was going on with the shelling but the combat line was neither advanced nor breached. The soldiers followed a similar strategy as Tic-for-tac that they never directly shelled bunkers nor supplies first, always retaliated with more accurate shelling when directly hit, always returned to pretentious shelling afterwards, and making sure that such behaviour was known to the enemy. This cooperative phenomenon which went on for a long time during the war saved many lives. From the perspective of a reformer, Axelrod proposed the strategy on how to promote cooperation. 1. Enlarging the shadow of the future - Mutual cooperation can be stable if the future is sufficiently important relative to the present because the players can each use an implicit threat of retaliation against the other's defection. 2. Change the payoffs - This is usually adopted by government in raising the payoffs in terms of taxes, harsh punishment for crime and obligations to honour contracts; that is: to raise the payoffs for cooperation and vice versa for defection. 3. Teach people to care about each other - Through education, adults shape the values of children so that the preference of the new citizens will incorporate their own welfare with the welfare of others. 4. Teach reciprocity - Always reciprocating defection may not be the standard of morality for some religions, for example the teaching of always cooperative by turning the other cheek. However, reciprocity is a robust strategy in upholding cooperation and avoiding exploitation. The self-policing feature of the strategy gives an incentive to cooperation. Teaching reciprocity to those with whom one will interact will help build a mutually rewarding relationship. 5. Improve recognition abilities - The ability to recognize the other players from past interactions and to remember the relevant features of those interactions is necessary to sustain cooperation. This is one of the stories in the book The Pig That Wants To Be Eaten. It is particularly interesting as it is about logical thinking on the usually illogical religious belief. God was having a conversation with the philosopher who thought that the fact of no evidence on the non-existence of god was not an evidence on the existence of god. God said to the philosopher, I give you a reason to believe: a gamble based on self-interest. There are two possibilities: I exist or I do not exist. If you believe in me and I exist, you get eternal happiness in heaven. If you believe in me but I do not exist, you get a normal short mortal life. If you do not believe in me and I do not exist, you still get a mortal life. If you do not believe in me and I exist, you will suffer from the eternal fire. It is easy to see that if you gamble that I do not exist, the best you can get is mortal life, but the worst scenario is eternal damnation. If you gamble that I exist, the worst you can get is the mortal life, but the best outcome is eternal happiness. So any person with a logical mind should believe that god exists; he could win a chance to heaven and not losing anything he already has, but could certainly avoid the worst of hell. This theory was proposed by Blaise Pascal in 1660 with a view to defending Christian faith by reason. The critics agreed that believing in god would be a good bet if there were only two such possibilities. However, there are much more than just choosing to believe in god, which god in particular. If there were such an envious and unforgiving god, believing in the wrong one would have serious consequences. Christians in particular consider that people not accepting Jesus as the messiah would surely go to hell, that would include many good Muslims, Jews, Buddhists and many other faithful religious people. Some would believe in a benevolent and all-loving god that eternal salvation would be granted if you just committed a mistake in believing the wrong god but would remain moral (which is a vaguely defined term in different times, cultures and religions). However, for such a good god, he would similarly grant eternal happiness to the non-believers who would be equally if not more moral. As far as gambling based on self-interest is concerned, the bet should be placed on the belief of one vengeful and punishing god who commands absolute belief in him, or the belief that there is no god or god is forgiving in whatever you believe as long as you are moral. Even if you bet on a nasty god, there are too many to choose from. Betting is not a rewarding game afterall. The recent hot news on consumer electronics is the victory of the Sony Blu-ray format over the Toshiba HD DVD format in high-definition DVD. Now that Sony Blu-ray has dominated the market, what should be its business strategy? Harvard Business is hosting a discussion on the topic and the leading article is Winning the DVD Battle but Losing the Innovation War. If you are interested, please take a look at the article and the ensuing discussion. Sony's victory is a textbook example of good marketing strategy. Gained from the painful experience of the failure of its Betamax videotape format, which was a better technology but not supported by marketing effort in the video rental business, Sony worked hard this time to align with major movie studios and also packaged its PlayStation 3 video game console with Blu-ray technology at a higher cost. Its effort finally paid off. However, there was criticism that Sony wasted too much resources on Blu-ray while it should not lose sight of the emerging high-definition video sources from the Internet. This kicks off the debate on the competitive environment of the high-definition video industry. Some experts brought out the Michael Porter Competitive Forces model for analysis. The lead article points out that innovation is a multi-front contest. Focusing on the mainstream and the high end is insufficient. Winning the innovation war requires mastering the ability to counter threats emerging in the low-end of existing markets and to seize opportunities in new markets. In this respect, the discussion targets on the development of the Internet-based content delivery services. Although there is consumer demand on the very best quality DVD technology, the proliferation of Internet-delivered video shows that there are many consumers who are willing to trade off picture quality for convenience and low prices. People are debating whether the competitors from the Internet are new entrants to the market and substitute products. Some argue that the present ability of the Internet in terms of bandwidth is insufficient to deliver high-definition video as a substitute to Blu-ray. Also, there is still no convenient storage devices which could compare to the 50 GB DVD. As such, these service providers will not enter the high-definition video discs market as a competitive force. However, there are more optimistic people who have confidence that the Internet will very quickly evolve to be an effective carrier of large high-definition video files with sufficient bandwidth for streaming. Many companies such as Apple, Comcast, Netflix, Cisco, Motorola and many others are competing to improve the ability to download movies over the Internet. The winners could be those which could develop new business models that make it simple, easy, and cheap to obtain such content. For storage, Europe SKY is now broadcasting in high-definition and customers can get a satellite tuner that allows recording of movies to their hard disks. Furthermore, there are now portable devices made by Archos, Creative and some hard disk manufacturers which could offer convenient storage of over 100GB. For the limitation of the Internet bandwidth, many technologists have devised high quality file compression programs to help transfer large files. Sony has done everything right in the Blu-ray battle. But it could face long-term trouble if it allows its Blue-ray strategy distract it from addressing disruptive development in the video delivery market. It must be prepared for any change in its competitive environment.